A whiteprint is a similar type of drawing, but with a blue line on a white background. Whiteprints replaced blueprints because they were easier and safer to produce. 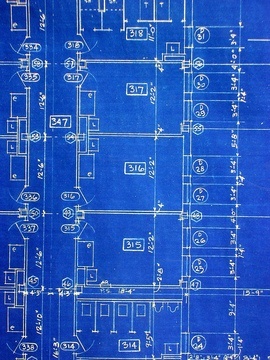 Traditional blueprints take the most time because they must be drawn by hand. Using CAD software makes the process faster and therefore cheaper. It may also be possible to make changes to an existing blueprint if the project is a minor addition to an existing structure. This would save money compared with having an entire blueprint drawn. A draftsperson usually charges $100 to $130 an hour, and drawing a CAD blueprint for a 1,000 square foot space takes about 8-16 hours.